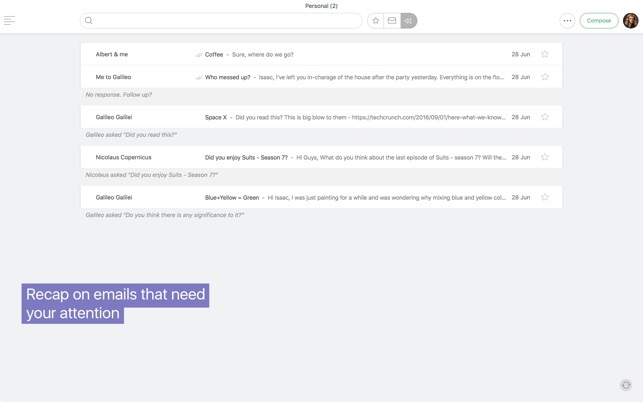 Newton is a subscription-based service that supercharges your email with power features like Read Receipts, Send Later, Undo Send, Connected Apps, Recap (Only English), Snooze, and more across iPhone, iPad, iPad Pro and Mac. Your Newton account is your key to all things Newton. Use it to instantly access your email anytime, across ALL your devices. ● Instant push notifications for ALL types of email, including Gmail, Hotmail, Exchange, Yahoo Mail, iCloud, Google Apps, Office 365 and any IMAP account. 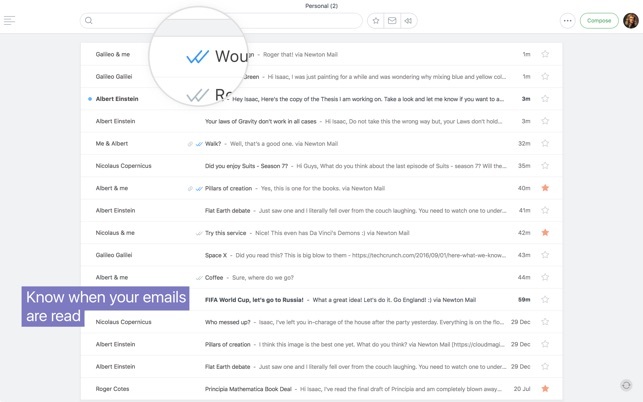 ● Read Receipts - Get read-status for every email you send. Also get notified as soon as the emails are read. Know exactly who read your email with individual mail tracking. ● Snooze - Set your emails to come back to Inbox at a more convenient time. Got an important email while travelling? Just Snooze to Desktop and deal with it only when you’re ready. Snooze emails, not productivity. 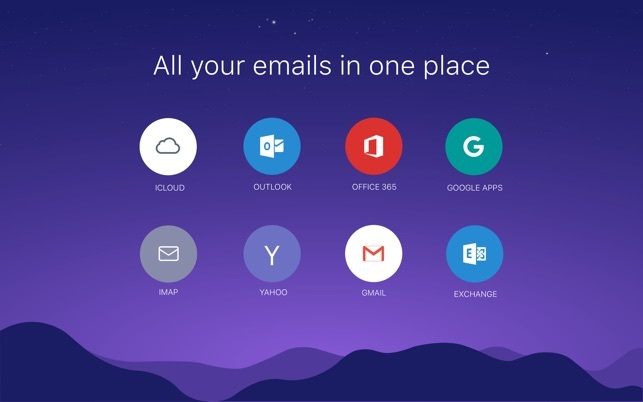 ● Connected Apps - Finish your workflow without leaving your email. Add important emails to your favorite productivity apps like Todoist, Evernote, OneNote, Pocket, Trello, Wunderlist, Instapaper, Zendesk, Salesforce & Asana. ●Quick Filters - Find important emails with one-click Starred and Unread filters. ● Handoff - Effortlessly hand off what you’re doing on iPhone, iPad or Apple Watch to Mac. ● Keyboard shortcuts that get things done quickly. Shift + U - Mark as Read / Unread and many more. If you’re looking for a mac-based email client, Newton is the best (and believe me, I’ve tried them all). IT’s light and clean. The keyboard controls are easy and intuitive to learn, and it handles all of my various email accounts on various platforms. It doesn’t hog memory or space, and it just gives me what I need as I need it. Did I mention the search function is brilliant, too? Yes. It’s not clunky and it does present all of my email in a clean, easy to read format. and the ipad and iphone apps are just as good — and the seamless connections betwen ipad and iphone are simply glorious. 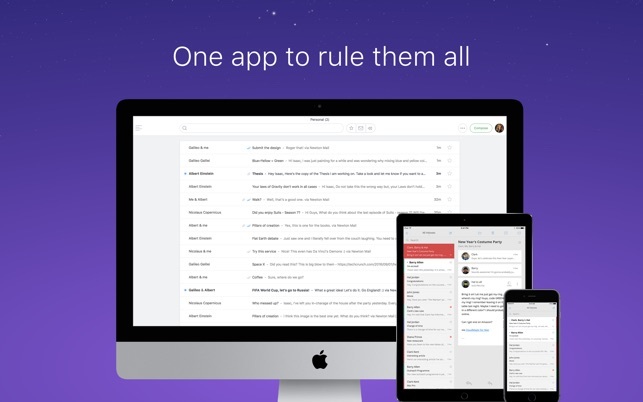 this is an amazing replacement for the clunky mac mail and its waaaaay better than the other alternatives. If you’re like me and you use email all day every day, and you like things that are clean, efficient and practical, then Newton is for you. I know that some people balk at the price, but really - for something I use literally EVERY DAY (all day), that’s a really small price to pay for a stable, smart platform, and its even less to keep the people who make it in business, so they can keep making great stuff. I’m really pleased with Newton email. As mentioned by other reviewers, aesthetically the interface is clean and crisp. The product stays out of your way visually and provides a modern legible platform for reading and composing messages. The search function is fluid and global - instantly displaying results with type-ahead ease. The desktop app settings are simple and convenient, affording users the ability to customize the way messages are grouped and what "quick actions” should be displayed. With Newton I can rely on managing a majority of my email actions and correspondences without technically exiting the primary display of the inbox. I also appreciate the fact that the mobile app version of Newton works seamlessly with the desktop app - maintaining absolute parity between both versions of my mailbox (with zero delay). The annual cost of the software is easily justified based on the benefits Newton provides me. I have used a number of different email applications over the years and I've have no regrets since switching to Newton. You do not want this! If you have $50 (or more) per year to burn on an ok product then look no further. I was having reliability issues with certain accounts linked to my apple mail app so I switched to Newton about two years ago. The first year it was free and fairly basic which is all I needed. Year 2, they forced me into paying $24 per year for what they called superchargers that I neither needed or wanted, but it was during finals and I didn’t have time to shop around. I needed my email to work so I paid the extra money even though I didn’t need the extra features. Now this year, it’s finals time again and the price to access my emails has gone up to $50!! Worse yet, I’m completely locked out, I can’t access anything unless I pay the money. I understand some subscription costs for the extra features, however none of the features are worth $50 a year, honestly it isn’t worth $50 as a one-time cost. How about some tiered options for users that don’t need all the bells and whistles?? And maybe don’t double the price every year. Either way, I’m not giving them one more penny of my money, app deleted. Also, it’s been very glitchy as my subscription was running out, now Apple mail is the more reliable of the two.